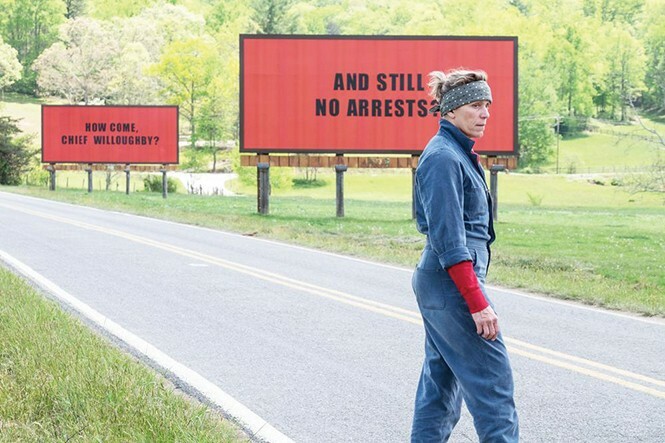 Three Billboards dares to imagine a world in which anger isn't righteous. Mildred Hayes (Frances McDormand) is a woman with a mission. Seven months removed from the horror of her teenage daughter, Angela, being raped and burned alive along an isolated stretch of highway near her home in Ebbing, Mo., Mildred is outraged that there has been no apparent progress in finding the perpetrator. So in an attempt to nudge local police Chief Willoughby (Woody Harrelson), she opts for the nuclear public relations option: She rents three adjacent billboards on that same stretch of highway and offers a provocative message. "RAPED WHILE DYING" "AND STILL NO ARRESTS" "HOW COME, CHIEF WILLOUGHBY?" Three Billboards Outside Ebbing, Missouri offers the set-up for a movie about a scrappy underdog's righteous war against an uncaring system—except that's not what the movie is about at all. Writer/director Martin McDonagh has crafted a story built around the toxicity of anger. In a fundamental sense, it's an idealized vision of what the world might look like if we could find an antidote for that toxin. That's certainly not the impression you're likely to get at the outset. McDonagh employs the same acidic dialogue that has sparked his plays and his previous features In Bruges and Seven Psychopaths as he introduces Mildred's scorched-earth approach to getting justice for Angela. McDormand's electrifying performance is all hard edges and caustic interactions, so deep in her own grief, that the fact that Chief Willoughby is facing a terminal cancer diagnosis does nothing to shake her determination to publicly shame him into action. When a local priest comes to visit Mildred and her son (Lucas Hedges) to encourage her to take the billboards down, she tears into him over the Catholic Church's sexual-abuse scandals, in the kind of speech that gets audiences whooping in agreement. There's just the small matter that McDonagh is implicating anyone in the audience who's still fully on board with Mildred's behavior. He provides plenty of context for Mildred's rage over victims not getting justice—including her own history with an abusive ex-husband (John Hawkes)—as well as her guilt over the circumstances leading up to Angela's death. What's similarly clear is that, at least in this case, the Ebbing police haven't actually done anything wrong. Willoughby has been investigating, and has simply run into dead ends. Mildred wants someone to blame. She needs someone to blame. Even if it's a dying, well-intentioned, well-respected police chief. What McDonagh explores in Three Billboards is the impact of chain-reaction hate and rage on everyone in its path. He takes the riskiest approach in the creation of Officer Dixon (Sam Rockwell), a police officer who has already been implicated in the beating of a black suspect, and who lives with his openly racist mother (Sandy Martin). In 2017, it feels like an act of artistic suicide to suggest that there's hope for redemption in those who abuse power, but McDonagh gives Dixon a messy and complicated arc—played with genuine complexity by Rockwell—that includes some brutal, seemingly unforgiveable behavior. But again, this is an idealized vision McDonagh is delivering—a sort of foul-mouthed, unsettling spin on Pay It Forward—and he's as audacious as he can be in delivering it. Are we prepared to consider that the worst person we know could be better if they just let go of their darkest emotions? McDonagh is a writer first and foremost—notwithstanding a few great visual moments like the bold design of those billboards—and there are times when his big ideas bump up against our expectations for real-world behavior. It might come off as too broad when a black supervisor is brought in to deal with the rogue elements in the Ebbing police force; the exchange of dialogue immediately preceding Angela's never-depicted death could feel so on-the-nose that the nose would be broken by the impact. But the mistake would be continuing to think of Three Billboards as a story that congratulates us for cheering along with acts motivated by fury, even when we think the circumstances warrant it. As darkly comic as McDonagh's words might be, there's a grace and optimism here that could leave a lump in your throat. It takes a lot of nerve in these times to suggest that anger is rarely righteous.